There can be as many as 35 different inactive ingredients inside a medicine. If you have a bad reaction to a medicine, it might not be the drug itself, but what are called "inactive ingredients" in the pill or capsule. An article published Wednesday in Science Translational Medicine surveys this field and finds ingredients that are potentially troublesome for some people are ubiquitous. For example, a few years ago study co-author Giovanni Traverso, a gastroenterologist at Harvard-affiliated Brigham and Women's Hospital, came across a patient with a severe gluten intolerance called celiac disease. The person was having trouble with a medication that apparently contained gluten as an inactive ingredient — potentially making the condition worse, not better. Traverso, who is also a biomedical engineer with an appointment at MIT, started exploring this topic with some colleagues by weighing pills in the hospital pharmacy. They concluded that, on average, about 75 percent of a pill or capsule is made up of inactive ingredients – that is, material other than the chemical or chemicals that determine the therapeutic effect of a drug. In their article, the scientists say drug companies have more than a thousand of these inactive constituents to choose from. "In some instances there can be up to 35 of them in a single pill," Traverso says in an interview. Traverso says these inactive ingredients are essential to stabilize medications and sometimes to help the body absorb the active ingredients. "I don't want to malign inactive ingredients in any way," he says. "I think inactive ingredients are very helpful." But they can include materials such as gluten and lactose, and dyes that can trigger allergies. In general, the amounts in a given pill aren't concerning. But many people take multiple medicines, and if those drugs contain the same inactive ingredients, the doses can add up. If you are lactose intolerant and take a pill that uses lactose as an inactive ingredient, "it's probably not going to manifest in any significant symptoms," he says. "But as the number of pills you're taking [increases], then certainly you might cross that threshold." One challenge in understanding the scope of this problem is, it's often not clear how much of a particular substance is necessary to trigger an allergy or other reaction. "It's something that might vary from one person to another," Traverso says. But for a lot of these ingredients, "we don't really know today." The Food and Drug Administration regulates these drug ingredients. Among other actions, it has issued draft guidelines that would specify how companies should label drugs that contain gluten. Dr. John Kelso, an allergist at the Scripps Clinic in San Diego, has reviewed the issue of allergens in medications. He says reactions are actually quite uncommon. In fact, it's usually a false alarm. For example, after many years worrying about the traces of egg protein in flu vaccines, health officials now say that people with egg allergies are not at risk from the shot. Overreaction to this worry can actually backfire. "Oftentimes the medications are being withheld from patients who say they're allergic to eggs or soy or something else that may be in the medication," Kelso says, "but it is actually not a problem." Penicillin, though an active ingredient, is a prime example of overreaction. "We realized lately that approximately 95 percent of patients who are labeled penicillin-allergic are not," he says, "either because they never were or because they had an allergy that waned with the passage of time." An allergist can test people to see if they're actually allergic to this useful and inexpensive antibiotic. For people who are concerned about the inactive ingredients, Traverso says it is possible to track down that information. Look through the fine print in the instructions (referred to as a package insert) that come with your medication, "and eventually you will find it," he says. The National Library of Medicine also has an online database, called Pillbox, with this information. 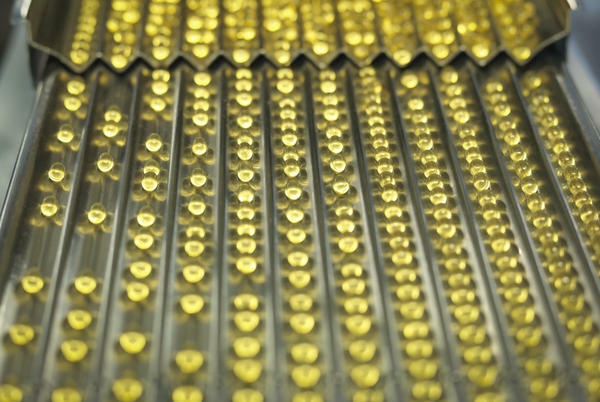 Different manufacturers of the same medicine often use different inactive ingredients, so if one drug might be causing trouble, it's worth considering a switch to the same product produced by a different manufacturer, Traverso says. He and his colleagues have a patent pending on an algorithm that is designed to make this sleuthing easier. They're thinking about developing a consumer app or some software to help doctors and pharmacists review all the drugs they are taking, so they can alert their patients to potentially troublesome inactive ingredients. If you have a bad reaction to a medicine, it might not be to the drug itself but to other ingredients in the pill or capsule. An article in Science Translational Medicine examined the issue and finds that the average oral medication contains eight inactive ingredients. NPR science correspondent Richard Harris reports. RICHARD HARRIS, BYLINE: A few years ago, Harvard gastroenterologist Giovanni Traverso came across a patient with a severe gluten intolerance called celiac disease. The person was having trouble with a medication that apparently contained gluten as an inactive ingredient, potentially making the person's condition worse, not better. Traverso got intrigued and found that the typical pill is more inactive ingredient than actual drug. GIOVANNI TRAVERSO: It's somewhere around 75 percent of the actual, you know, pill or capsule is actually taken up by these inactive ingredients. HARRIS: And drug companies have more than a thousand to choose from. They can include materials like gluten and lactose and dyes that can trigger allergies. TRAVERSO: In some instances, there can be up to 35 of them in a single pill. HARRIS: He says these inactive ingredients are essential to stabilize medications and sometimes to help the body absorb the actual drug. People taking multiple medicines can end up getting the same inactive ingredient from several pills and get an unexpectedly large dose. Say you are lactose intolerant and take a pill that uses lactose sugar as an inactive ingredient. TRAVERSO: It's probably not going to manifest in any significant symptoms. But as the number of pills that you're taking - then certainly you might cross that threshold. HARRIS: One challenge and understanding the scope of this problem is it's often not clear how much of a particular substance it takes to trigger an allergy or other reaction. TRAVERSO: You know, and it's something that might vary from one person to another. But, you know, for a lot of these sugars and other ingredients, we don't really know today. HARRIS: In San Diego, John Kelso, an allergist at the Scripps Clinic, says he occasionally comes across patients who have had an allergic reaction to something in their medications. JOHN KELSO: It's actually, we think, quite uncommon. HARRIS: In fact, most of the time, it's a false alarm. For example, after many years worrying about the traces of egg protein in flu vaccines, health officials now say that people with egg allergies are not at risk from the shot. Overreaction to this worry can actually backfire. KELSO: And oftentimes the medications are being withheld from patients who say they're allergic to eggs or soy and - or something else that may be in the medication. But it's actually not a problem. HARRIS: In fact, one of the most common allergies to an actual drug, penicillin, is itself overstated, Kelso says. KELSO: We've realized lately that approximately 95 percent of patients who are labeled as being penicillin allergic are not either because they never were or because they had an allergy that waned with the passage of time. HARRIS: For people who are concerned about the inactive ingredients, Traverso at Harvard says it is possible to track down that information in the fine print that comes with pills. TRAVERSO: One can look in the inserts of medications. And then, you know, you can look through all the texts, and eventually you'll find it. HARRIS: The National Library of Medicine also has an online database called Pillbox. Traverso and his colleagues have a patent pending on an algorithm that can help make this sleuthing easier. They're thinking about developing a consumer app or some software to help doctors and pharmacists alert their patients to potentially troublesome inactive ingredients. Richard Harris, NPR News. Transcript provided by NPR, Copyright NPR.